Ubuntu templates, the one thing they always forget to add in the release. Sure you can add your own, but that’s always a pain to do yourself. But first, an explanation for the newer ubuntu users. 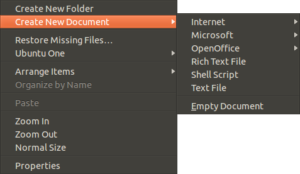 Whenever you right click on a folder or the desktop in ubuntu, you are given the option to to create a file. If its a new install, it will almost certainly tell you how it doesn’t have any templates installed. The simple fix is to go to the ~/randomuser335/Templates folder and make some files, and most of us do. However, doing that with every new release is a pain, so i spent about thirty minutes setting up a whole bunch of files and adding them to a file to share with everyone else. Now, you just need to come here and get my file, and copy its contents to your own templates folder. And I had, to my absolute delight, the chance to install it on an asus netbook, and try it out. I also had, to my tentative enjoyment, to test it out on my desktop. Let me explain, the new ubuntu 11.10 now uses unity as its default interface. why is that bad and good? It was originally made for netbooks, and as such it looked great on the netbook. But, its new sidebar was terrible on the desktop. Worse, the sidebar can’t be moved according to this, and my messing around with it failed to change that. Other than that, the new default unity interface is great, and ubuntu 11.10 is great also. When i installed it on the netbook and looked around, i was thrilled everywhere i went. The new interface, (i always used the main ubuntu for the netbook, even though there is a netbook version) has me feeling right at home. If you have a 16:3 desktop screen, 11.10 will only make you happy. If you have a 4:3 desktop screen (like me) Unity will annoy, but it won’t hurt you, and its always fun to mess with a new OS. 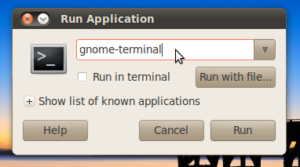 The previous command stops the system app running the gnome panels, allows the system to restore the settings to their defaults, and starts the panel back up. if you did not delete the settings with the rm -rf command, this would have just restarted the gnome panels. And for those of us who don’t care and just want their panels reset quickly, you can copy/paste the below command into the terminal, and it will have the same effect.